Well, since I'm here today, I thought I'd ask about a second item. 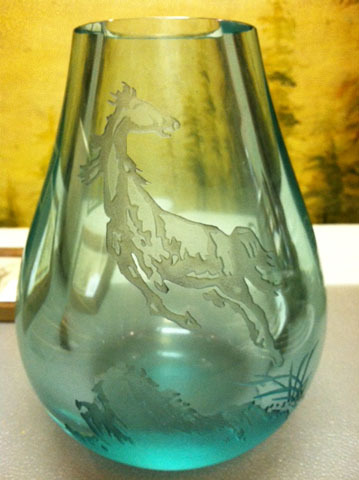 This is a very heavy crystal vase with a sandblasted stallion. It seems to have Asian marks. Any help is appreciated. 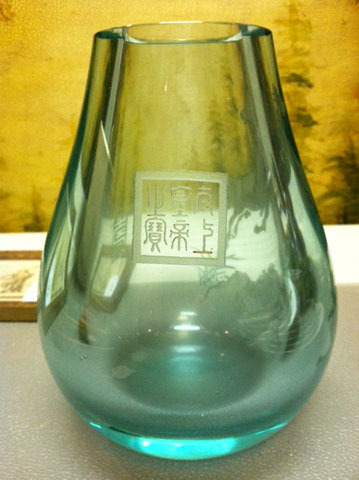 this is a contemporary Chinese vase, the horse imitative of Xu Beihong's well known paintings, the narrow mark imitating a Qianlong imperial seal reading "longevity", the squared one a fantasy imperial seal saying that the object is one of the emperor's treasure. This may well be high-lead-content glass, but what Westerners (especially Americans) call "crystal" is a very clear colorless glass, without the blue tint in yours. 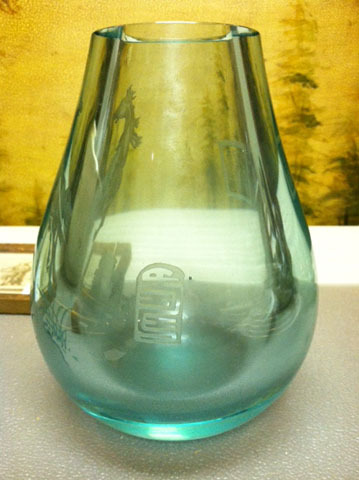 The high lead content makes molding and fire-polishing easier, since it lowers the glass's melting point. The horse is probably acid-etched rather than 'sand-blasted'. Thanks to rat for the translations.